I've been told by the organiser of a Learning Analytics symposium (because I blab on and on and on the forums for said topic area I think) that he'd like me to present. I'm not very experienced in this. I do do training, generally remote and with a few people, so I have a little idea of presenting, but in front of people, and knowledgable people at that!, I am practically a virgin. Any tips from shipmates who have presented at conferences / symposia? Tips from specifying your presentation to preparation to delivery (after that it's run away quickly and hide, isn't it?) appreciated. Look at audience, don’t just read your notes without raising head. If you know someone in the audience, pretend t yourself that you are speaking to that person. Also works for preaching. I used to imagine a woman I quite liked but who was not at all scholarly, although she was very intelligent. Aim at that peerson. Neither condescend nor speak way above the average level expected of audience. Just a few ideas off top of my head from preaching and being keynote speaker at several week long residential conferences. Not to the point of reciting the whole thing, but get up in front of a person or two and go through a second or third draft of your presentation. This will show you whether your story and delivery flows and you will also be able to hear whether you overuse particular words or phrases (which sounds normal in conversation but begins to grate in a presentation) and give your trial audience the chance to spot typos, strange transitions and bits and pieces of your slides that don't line up nicely. We do this for every outside presentation anyone in our research group is doing, from our undergraduate students right up to the Professor who is head of group and in the case of the more inexperienced members it really makes them stand out in abstract sessions or workshops against people who may be well prepared but are not well practised. And you'll probably go a bit faster on the day than you have in practice so take that into account when checking your timings. Good luck! I used to print out my notes in a large font to facilitate a quick look-down while presenting and to help me maintain eye contact with the audience. 1. Tell them that you are going to tell them. 3. Tell them that you told them. That is, the first part is an outline of the subject and approach, to let people be prepared for what is coming. The third part is a mirror of the first part. Now you've had the meat of your talk (apols to vegetarians) you can summarise and show them how the outline you made at the start has now been filled in. Try to be deliberately slow in your speech, particularly if you may be nervous. There can be a tendency to rush, so if you think you're going too slowly, you're probably at the right pace. If using PowerPoint, don't put up a slide with lengthy text and then read it through - your audience can read more quickly than you can speak! By all account use graphs, headings and pictures that comment on or illustrate your brief (I do that in my sermons). I wouldn't even think about not using PowerPoint. But, use it as an aid and a parallel presentation. So, don't just read what you put on the screen. It gives you an opportunity to present two ways at the same time, use it. It also gives your talk structure, so if in the glare of being up front you get a bit flustered it's a crutch to support you, cues to what you should be saying - it you want to you can set the slides to advance at particular times to help you keep to time. 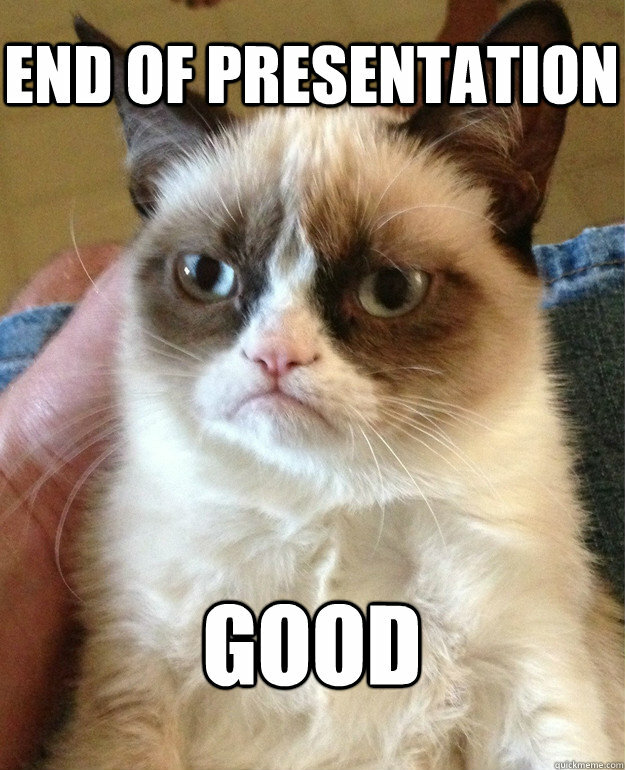 Though exactly how you use PowerPoint will depend on the nature of your presentation. I give scientific presentations; so have graphs or equations to show, small tables of figures. Text is rarely more than enough bullet points to get the main points across. I've seen presentations from social scientists where their slides have just contained short quotes from interviews or similar, and that works very well. But, ultimately the best advice has been given. Practice, refine, practice in front of people you trust to help you. On the day, relax and breathe properly, don't rush it. Get to know other people there over coffee and other breaks before your talk (unless, of course, you're on the first session), speak to people who have already presented and ask them questions - that way you're not standing in front of a load of complete strangers. In the olden days you thumped your harp and shouted ‘Hwæt!’ but a slide with an arresting image, or a striking quote or a visual aid. (I once dropped an EU Bulletin from head height to the floor to great effect.) Then say something amusing. You have now aroused their interest and persuaded them that what follows will be entertaining. Maintain this impression by speaking clearly, while looking at them, preferably in short sentences. Have slides which illustrate your talk not duplicate it. As has been said, finish with a recap and a flourish (preferably one that ties into your opening gambit). Powerpoint can be a horrible pitfall; don't use it unless your presentation clearly calls for it. The same with videos; the number of sermons I have sat through laden with idiotic powerpoint slides or moronic videos is depressing and makes me seriously reconsider church attendance at all. If you must, be certain that your equipment and the site's media setup work and work together. Do not take anyone's word for it; plug it all in on site and see it working. Don't be one of those awful presenters where the first five minutes is spent trying to make the screen come to life. Be certain that your equipment and the site's media setup work and work together. ... Don't be one of those awful presenters where the first five minutes is spent trying to make the screen come to life. Couldn't agree more - it's like concerts where the performer comes on stage and then spends ages messing around with music stand, chair and tuning. I have to present to groups of 50 to about 200, 5 or 6 times per year. In my opinion, slides are generally essential if the audience is diverse in knowledge such that some may not pay attention. (you can use powerpoint or any other presentation software). They need something to take away, and the slides may be all they have. I plan on 2 mins per slide, disregarding the throwaways: titles, transitional slides like pictures or cartoons. If the screen is behind you, you want a laptop on the podium or table so you can see what's on the screen and you want to control the projector from that computer. If they microphone you, it needs to be a wireless lapel mic, and you need to be there 15 mins early for it and the computer slide gizmos to be set. Ordinarily, they ask for slides ahead of time these days, but always bring a USB thumb drive just in case. The slides need to be your cue for what to say next. No notes to be read. Which means knowing the topic thoroughly is important. We seem to be divided on powerpoint. I'm a fan. If you are a visual learner, sitting and listening to someone talk for 30, 40 min is a chore. Visuals will help you focus and retain what is being said. Auditory learners can look away or close their eyes if they must, but throw us poor visual learners a bone. The key for any illustration-- whether powerpoint, object lesson, story, or video-- is that it support your main point. Remember that the illustration is for many people going to be the ONLY thing they remember. Some speakers (preachers in particular) will find a movie clip they find funny, or moving, or whatever, that relates only tangentially to their message. That's a huge mistake-- yes, everyone will love the clip, but only the clip-- you've lost the main message. So find an illustration-- chart, story, film clip whatever-- that directly drives home the one and only point you want to make (because really, you can only say One Thing and then just repeat/expand on it). Don't have too many, which can be distracting-- even just one really strong visual (or descriptive story) is great if it supports that one main point. Yes to checking out the tech equipment in advance. However, know that equipment failures do happen, and tech people often show up at the 11th hour giving no chance for an advance run-thru. So have a plan in place for how you will proceed if your tech fails. Don't spend an interminable amount of time fussing over it-- if it doesn't happen, move on. Knowing how you will proceed if that happens helps you not be flustered, and shows you are a professional. The last time I did this, I used my iPad, an idea at a time. Swipe down for the next..
Before the ipad I did it with my notes but drew an arrow on the bottom. If it wasn’t on the page before the arrow, I had to move on. Saved making unwanted digressions interrupting the flow of ideas. My only experience in public speaking is reading lessons in church, and I'd echo what Sipech said about slowing down - you almost always speak more quickly than you think you do. Thank you all. Wow. So much helpful advice. And such experience! I would've never thought of a lot of the ideas/suggestions/tips; this makes me feel a bit more at ease [for now! ], though reminds me of the preparation I need to do too. Oh, and one more bit of advice. If it is your habit to drink coffee, always drink coffee the day of the presentation. Whether you drink coffee or not, always go to the restroom just before you're on. I write "slow down" on my notes at the end of the first paragraph, and at a couple of other points in my notes. I'd also echo what others have said about no lengthy text on powerpoint. In my area (history) I use powerpoint to put up pictures of people and / or places as I refer to them, but I don't use text (other than captions such as "Mrs X, 1920" or "High Street c1890"). Powerpoint should provide something that talking alone can't; if you can say it, say it, don't put it on a slide. and check your fly afterwards! Ha ha leo! Good advice. Thanks Brenda, NEQ and Leo. And thanks all again. I re-read your posts and have been making notes. I suspect PowerPoint, or similar, will feature; and the conference host will have a template I must use. Are there tips for images? A lot of mine will be graphs and tables (I do data analysis) and I always worry about things not being clear, or too small to see. Would you put an image/screenshot on a new slide, not one with 2 or 3 points? Let's take this image which is one tab on a dashboard I did (excuse the bad anonymisation job; I've only got Windows' Snipping Tool at home!). Is this a no-no? Do I instead focus on one graph? And, at the presentation, would you consider a live demonstration of the dashboard (having pictures of slides in case it fails)? Or is it best to just stick to slides? Slides of anything need space around the text, tables, pictures. Don’t cramp the page with writing. Your axis labels are much too small for a presentation. I would write over the axes with a much larger font, so people can see what is plotted. What are you talking about here - the content of the data, or the fact that you use a dashboard display to give people an overview of what's going on? If the latter, showing the dashboard tab is fine (and correct). If it's the former, you're better off showing individual plots and not contaminating the view with all your dashboard hair. And in the latter case, show the plots that support the story you're telling, and no other plots. You never want to show people four plots and tell them to only pay attention to one of them. ETA: I'd almost never consider a live demonstration of anything. Nobody wants to watch other people type. You could have a live link prepared as a backup slide in case you need it for questions. A lot of mine will be graphs and tables (I do data analysis) and I always worry about things not being clear, or too small to see. Sorry, I missed this the first time round. The "big table of numbers" is a horrible horrible display format. If your table is bigger than about 3x3, please try to see whether you can plot a graph that will tell the story you want to tell in a clearer fashion. As I'm quite short-sighted, if I were in your audience, unless comparison of the graphs was vital I'd want them to be either on different slides and bigger, or at the least, two rather than four to a page. Just my tuppence though; I appreciate that my solution might not work. If there are features of the dashboard that require a demonstration, then give a demonstration. But, IME, that's usually only needed at some "how to use this new gizmo" workshop. Anything that required access to a web-based resource is prone to a whole range of technical issues that creates a high chance of it going wrong (slow wifi, or some form of difficulty with the permissions needed on the system you're working from). If it's an installed program then many venues will run presentations from a single computer (swapping projector inputs between presentations is a real pain) and often you won't have permission to install your software if not negotiated a long time ahead. In either case make sure you've tested it immediately before your presentation). A recording of your screen as you run through the dashboard may work, you can edit out all the typing in to reduce time, and still show what it looks like. Remember to ensure the video file is copied over and accessible on the local system used for the presentation. As has been said, if the data is the important part then get the data plotted on a good bit of dedicated software giving you full control over the fonts, line weights, symbols, scales etc. And, then plot only the data necessary for your point - you can create additional plots to illustrate points you don't want to cover but may come up in questions. In addition to preaching lots and occasionally doing presentations, I do interpreting for lots more. I've discovered that the kind of technical problems referred to occur from the humblest of environments to top-level international conferences. I agree with much that's been said and would add that a good presentation uses a PowerPoint as a support to the talk, not the other way around. It shouldn't be indispensable (I almost never use one when preaching): if everything breaks, you still have something interesting to say (only last week I was unable to use a brief presentation because of very short notice being called on stage, but my short talk happily did not rely on having it). Not having all your text on the PowerPoint also ensures you don't face the PowerPoint instead of the audience when reading it. Do not in any circumstances simply read any paper you are going to publish in the proceedings: everyone will be asleep within the first paragraph. The must-read on PowerPoint is this essay which argues the Columbia disaster was in part attributable to how PowerPoints present information, specifically engineering information. And the go-to PowerPoint presentation is this one. Make sure you watch right to the very end - it's only 4 minutes and anyone who's ever attended a symposium will identify with it. Dress for comfort rather than elegance (within reason). These days, most people don't care how you look if you are talking sense, but uncomfortable clothes can be a terrible distraction, and it shows. (I'm remembering giving a presentation in an overheated lecture theatre while wearing a very scratchy tweed jacket). Also, don't crack jokes unless both funny and relevant to the topic. Thank you all; exceptionally helpful and useful. And, again, many things I had not considered. Thanks for sharing your wisdom and experiences. And remember too that written English and spoken English are two different things. Your spoken sentences need to be shorter and simpler than written text would be. Thanks very much Baptist Trainfan. Don't know if it's too late for this, but the Ted people have a load of good stuff about speaker preparation like a speaker guide and specific guidance on slides. Scope the room beforehand if you can. Arrive early. Watch others present in that room before you do. I happened to be an MC at the event I was speaking at before I was on to present and it was a BRILLIANT way to familiarise myself with everything so that ,come the actual presentation, I was thinking about THE PRESENTATION, not some detail about the room or A/V. One particularly amazing thing was that the room I was in had a BIG analogue clock on the back wall. While I was MCing I noticed that one of the speakers had been going for a while and I looked up at this big clock and...WOAH...that still had a long time to go. Turns out the clock was 4 minutes slow. Mental note: ignore the clock on the wall - it could make you panic! Also, I recommend using slides as cues, but avoid reading them out verbatim. Practice your talk in chunks. The slides cue you to start a chunk. So you say all the right things in all the right order without having to memorise the whole thing verbatim and without reading it all off the screen. Never apologise, whatever goes wrong the audience are unlikely to know. So don’t mention it. I have all the slides visual so that you are not tempted to read them out. Promise and give notes at the end but use graphics/photos on the actual slides, they aid your flow and memory but prevent the audience from sitting readin and not listening/interacting. Many Nonconformist churches have a clock like that ... and I have known it to STOP while the preacher (not me) was in full flood. It was a long sermon that day! Unless you're first up in a session there's a very good chance that you won't be starting on time anyway (with someone before you over running, or even taking less time than allotted). So, if you want to keep an eye on the time put your phone on the podium and run it as a stop watch - if you're blessed with a laptop to the front running a new version of PowerPoint that may give you a running time as well, but never assume anything about the AV system in advance. Alternatively, keep an eye on the chair and see when she starts signalling to get to the end. In fact, probably wise to do that whatever - if the chair doesn't notice you over-running a bit, don't sweat it, it probably means they're too interested in what you're saying to notice the clock themselves (which may not be true, but tell yourself it is). Alternatively, keep an eye on the chair and see when she starts signalling to get to the end. In fact, probably wise to do that whatever - if the chair doesn't notice you over-running a bit, don't sweat it, it probably means they're too interested in what you're saying to notice the clock themselves (which may not be true, but tell yourself it is). Some conferences try hard to force people to keep to the schedule, and will mercilessly cut you off if you go over. Others are very loose, and have big time cushions built into the breaks that they expect to use. And yes, individual chairs vary as well. There are often cues as to how strict the chairs will be. If the conference provides a set of traffic lights under control of the chair (or, a timer) then that indicates the conference wants their chairs to enforce times. If the chair approaches you before the session and tells you they have bits of paper they'll put up saying "2 minutes" (or whatever) then you know they'll keep a tighter reign on timing. Though, of course, there's no excuse for not doing all you can to plan and prepare your talk so that the chairs never need to be concerned about how long you're talking. And there are some, I understand, where your microphone will be cut off if you go on beyond time. My mother was chairing a session when one speaker went well over his allotted time, despite her warnings. When he finished, she stated that there was no time for discussion, and they would proceed with the next talk. Later, when she was standing at the back of an elevator, the offending speaker got on with a friend. He did not notice she was there and said to his friend, "Dr. D----- looks like a sweet old lady, but you've got to watch out for her." Maybe if he hadn't thought she looked like a sweet old lady, he wouldn't have run over his time. The biggest offenders at overrunning and ignoring the chair are also the same people who believe they can be clearly heard at the back of the room without a microphone. That same self-belief that makes them think that what they have too say is too important to fit into the allotted time, and that they are too important to be interrupted by a mere chairperson. I just came across this; hope it's not too late! Lots of useful information there , Eutychus. And that was very useful...and enjoyable. Needed a laugh. Thanks. And thanks all the continued advice. As a scientist, most of my presentations use power point or similar to show graphs or photos of apparatus. It is vital that they can be clearly read. So no big tables of numbers. But use big print and thick lines on graphs. To judge how big it needs to be, my tip is to print out the Powerpoint in handout format (6 slides to the page). If you can't read them easily at arm's length, and distinguish the several lines on a graph (if you have them) , then the audience won't be able to read your slide. Alternative test: look at your laptop screen from the far side of your room. Another tip for slides: avoid fancy colours or backgrounds, and maximise contrast. Just because a graphic looks great on your computer screen doesn't mean it will do so in your venue where the light (or darkness) will probably not be perfect. Black on white is the most foolproof. And as many others have said already, stick to your allocated time - practice until you get this right. And if need be shorten the talk as a consequence. This is good advice for everyone - especially the bit about sans-serif fonts. And there will be a percentage of dyslexic folk in every audience. Have a large print paper version for visually impaired people. Use a different font for the printed copy and for the screen. Verdana is a better on screen font than it is for printing, Helvetica is good for printing. Just under 2 weeks to go. And feeling more confident than I was reviewing this as I finalise everything. Or, I was, until I saw an email asking if I'd give a 20 minute video interview. Better think of something exciting to say! Then you need not be reminded to get a haircut well in advance. Select what you're going to wear with thought; white shirts nearly always do best and there are certain shades of blue that are really nasty on screen. Your legs and shoes may or may not be visible; just in case be sure you wear long-enough socks so that no unappealing slice of dead-white flesh peeps out of the gap between cuff and sock top. Amen and amen on the wacky type fonts. Never pull cute tricks like red lettering on dark backgrounds. It's just illegible.